This paper compares and analyzes the influence of lubricant supply temperature on the performance of a tilting-pad, equalizing, thrust bearing. The paper presents experimental data for a 267- mm (10 ½-in OD) bearing, operating at shaft speeds up to 13000 rpm with loads ranging up to 3.45 MPa (500 psi). The data presented demonstrate the relative effect that changes in lubricant supply temperature have on bearing power loss and babbitt temperature. Some conclusions are drawn based upon the trend in relative performance for each lubricant supply temperature tested. One of the parameters that influences the performance of a fluid film thrust bearing is the lubricant supply temperature. Decisions regarding the lubricant supply temperature are not only reflected in the initial cost of a project, but also in bearing performance and, ultimately, operating cost. Expensive energy has given bearing power loss added importance when evaluating design alternatives. Unfortunately, except for specialized bearing designs (1), (2), most techniques employed that reduce bearing power loss in a conventional thrust bearing design do so at the expense of the bearing pad or "shoe" operating temperatures. Increasing the lubricant supply temperature to reduce the effective viscosity is no exception, but the question of just how much the power loss and babbitt temperature will be affected remains unanswered. The purpose of this paper is to provide the information necessary to evaluate the effect of lubricant supply temperature changes on bearing power loss and maximum babbitt temperature, based on actual performance data. The effect of lubricant supply temperature was evaluated on a tilting-pad, equalizing, (6 X 6) double-thrust bearing arrangement. The bearing was tested using a light turbine oil which had a viscosity of 0.027 Pa.s @ 37.8°C and 0.005 Pa.s @ 98.9°C (150 SSU @ 100°F and 43 SSU @ 210°F - ISO VG32). 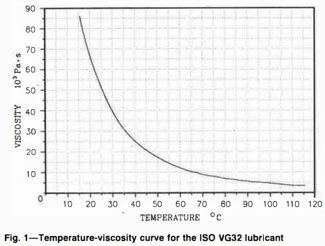 The viscosity-temperature curve for this lubricant is shown in Fig. 1. The lubricant supply temperature was varied from 43.3°C to 65.6°C in 5.6°C (11O°F to 150°F in 10°F) increments. The shaft speed ranged from 5000 rpm to 13000 rpm and the load ranged from a "no-load" condition to 3.45 MPa (500 psi) in increments of 0.345 MPa (50 psi).